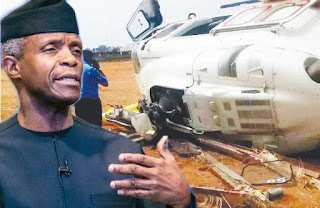 Meanwhile, the Arewa Consultative Forum said it was grateful to God for sparing Osinbajo’s life in the helicopter accident in Kabba, Kogi State, on Saturday. The ACF’s Secretary-General, Anthony Sani, who spoke with one of our correspondents on the telephone, urged the maintenance department to ensure regular service of aircraft in the presidential fleet to ensure the safety of the President and his deputy. He said, “We thank God. We are really grateful to God for sparing the life of our Vice-President, Prof. Yemi Osinbajo. Meanwhile, the AIB has asked the public to assist it by providing any video clips, relevant evidence or information as the agency investigates what led to the helicopter’s crash. The Commissioner/Chief Executive Officer, AIB, Akin Olateru, also stated that the agency would release factual information concerning the accident in a matter of days. Olateru was quoted in a statement by the Ministry of Transportation (Aviation) in Abuja on Monday as saying, “As the investigating agency, AlB needs and hereby solicits for your (public) help. He urged persons with useful information to kindly contact the agency via its official communication channels as stated on its website. “I would like to enjoin the press and the public to please respect the privacy of the people involved and not to preempt the cause of the accident. AlB will release the preliminary report which will include factual information about the accident in a matter of days,” Olateru added. The AIB boss said, “Accident Investigation Bureau, the agency of government created under the Civil Aviation Act 2006 with a clear mandate to investigate air accidents and serious incidents, has commenced investigation into this accident.